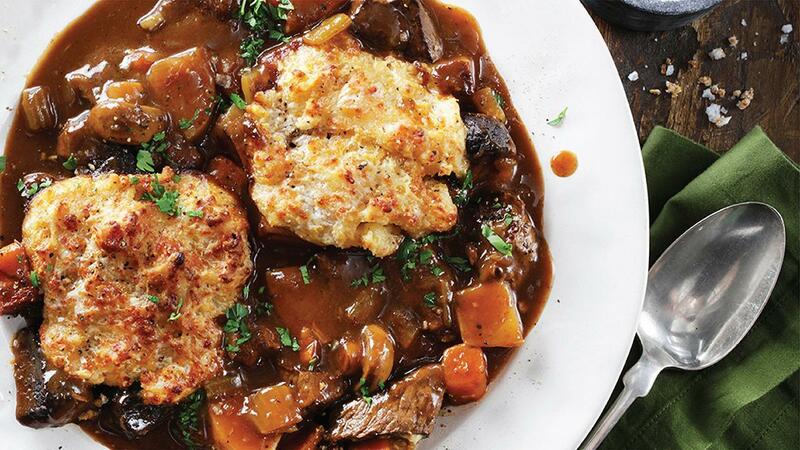 The Classic British beef stew almost always shares these same common features & it is considered one of the most popular comfort food for generations, the cheddar cheese added to the dumpling will give it a great twist! In a sauce pot, add Rafhan Corn Oil over medium heat and fry the beef cubes until browned on all sides. Remove the beef cubes from the pan and set aside. Add Knorr Demi Glace Base and water, Knorr Chicken Stock Powder, tomato paste and Worcestershire sauce allow to come to a simmer and stir with a wooden spoon. Remove the bay leaves and thyme branches, if the stew is still thin just add little bit Knorr Demi Glace Base stirring occasionally, simmer for another 10 minutes.